Mariella started back in 1989 working with weaving and construction of fabrics. In time, along wither her sister, they started to design unique handbags. They call themselves “Helen’s Daughters” in honor of their Mother who taught them how to sew and enjoy life. Her Sister, Char, lives in Wisconsin and Mariella is based in Minnesota. They have been working on their business for 23 years. They both graduated from the University of Wisconsin, nine years apart. They work on their designs separately and share the techniques they have mastered. 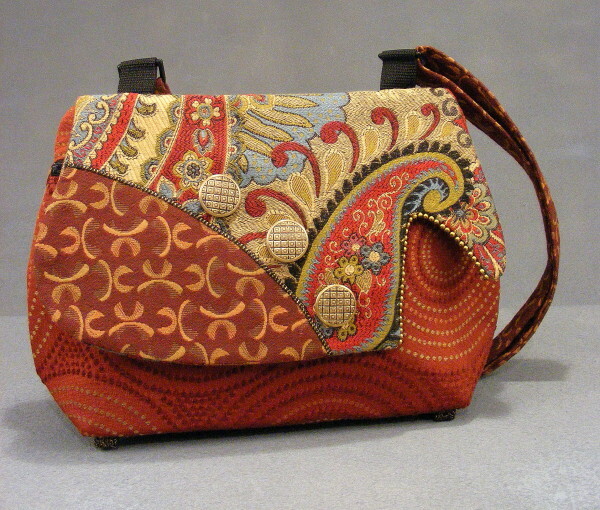 Mariella designs and creates fabric handbags made of upholstery fabrics that are adorned with unexpected details. She starts by sketching a design out on paper and then drafts a pattern. She works with the color and pattern of different combinations of fabrics, which creates a unique look for the handbag. The construction process is done by using a sewing machine and hand-sewn work.